I’ll Give You Safe Passage To The Wasteland. You are my memories and my happy thoughts. Your badlands span the corners of my imagination with dinosaurs and dusty adventures. Growing up in Alberta is a magical experience, and it’s a pity the rest of the world does not get to experience it. It’s exciting explaining to people how in a few short hours you can go from badlands with its coulees and hoodoos, to prairies, to vibrant canola fields, to skyscrapers and city life, to enchanting rocky mountains and turquoise lakes! It is exhausting and exhilarating trying to make people understand. But oh, when you do – life will never be the same. I admit I took the proximity of all these things for granted when I lived there. I assumed I’d be there for the long run and my adventures would be planes, trains and automobiles elsewhere. My favourite memories of Drumheller – the land of dinosaurs – were with my father and brother. Going on adventures to the Royal Tyrell Museum and hikes to see the Hoodoos, the abandoned Alberta mines and running up and down the layered sediment coulees. We even partook in a paleontological dig that was happening at the time. In truth, my brother is what set my obsession with dinosaurs up for advancement. Of course he loved dinosaurs, so being the younger sister I HAD to like exactly what he liked. That obsession never went away and eventually it grew into something that still, to this day, I get crazy excited about. My husband knew for Christmas that a Blu-ray box set of Jurassic Park was better than anything he could have gotten at Jared’s. (No offence Jared, but diamonds will never beat out a piece of copal containing a mosquito with paleo-DNA.) I was never a strong math student so unfortunately my dreams of becoming anything in the sciences field of paleontology were quickly diminished. Wah, wah. Fear not! I discovered the arts. And those arts eventually brought me back to do this super wicked Mad Max inspired photo shoot in my Neverland. 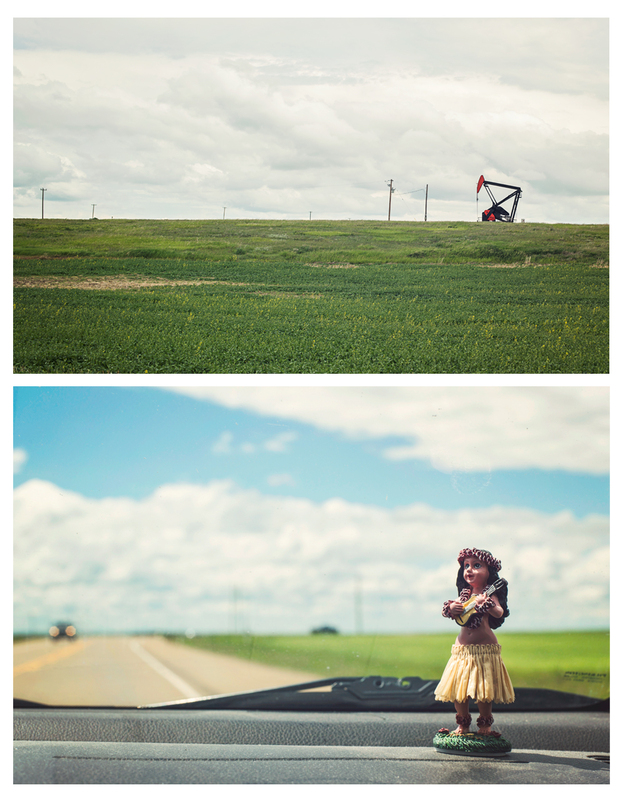 I wanted to take advantage of my time in Alberta to do this photo-shoot that had been in my mind for a while. I was at an art show in downtown Calgary when I was introduced to this dashing looking fellow. I told my friend whom I was with, “He’s handsome. He looks like Jon Snow. I want to take him to the desert and shoot him.” Of course to anyone else that is entirely creepy and sounds like I’m about to murder this poor, ridiculously good looking man and dispose of the body. But to an art student that sounds like every other Tuesday. So the next weekend the three of us became our very own road warriors and began the road trip to Drumheller. Due to schedules, flights and commitments, we were only there for an hour, but in that hour we had managed to pack in a tourist/photoshoot extravaganza. Zack, the male model is from the east coast and had never been to the Badlands. We waited for the magical moment where the prairies and canola fields dropped off into the coulees. If you’ve never been there, you just don’t get it. 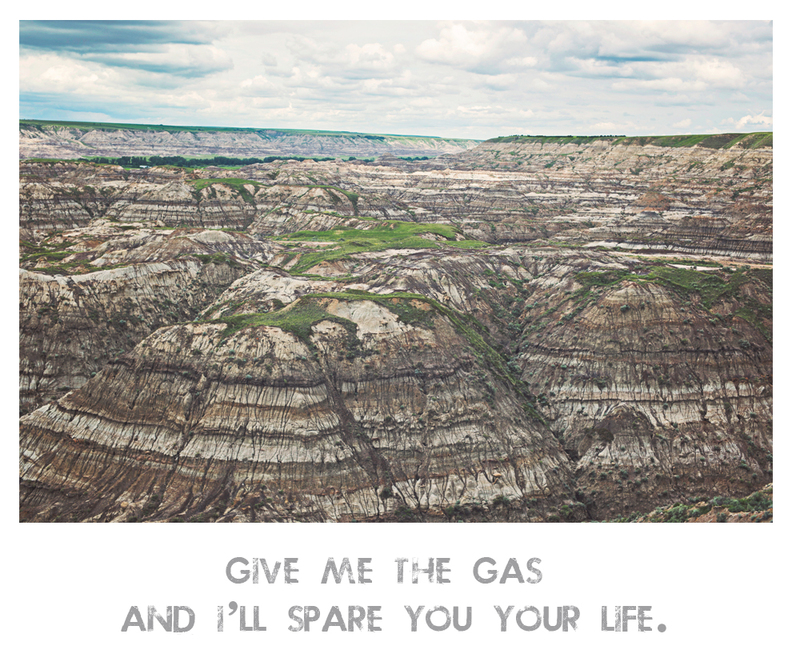 You’re driving along, thinking you will never ever ever ever ever get to Drumheller. You begin thinking that it’s going to be a disappointing grass field with a giant dinosaur statue. Yawn. Then it happens. Enjoy. And remember: Just walk away. Thanks for remembering our trips so fondly, dear Daughter…It warms my heart that you so do. Nice photo shoot, Siobhan!! !…and, folks…from the top of those badlands canola fields to the bottom of those coulees, you are looking at about 75 million years of ‘time’, of sediment build-up at the bottom of the long-ago great inland ocean that used to cover both the Canadian and American prairie. About 65 million years down is a layer denoting where/when a great meteor plunged into the Caribbean, thus enveloping the earth in a layer of ash and water vapour (Canadian spelling) and thus ended the dinosaur age. Below that layer, there are dinosaur fossils but, above it, there are none. Thanks, Siobhan (and fellow wanderers), for a great photo shoot!! !